Pope, Jesuits and Anglicans refuse to deny criminal charges made against them – Trial to proceed as shocking new evidence suggests Joseph Ratzinger still wields power at the Vatican – Ratzinger and others are named as members of a child abuse cult. After being publicly charged with child trafficking and criminal conspiracy on March 4 and served a Public Summons, the head officers of the Vatican, the Jesuits, and the Church of England have refused to deny or contest the charges and will therefore face criminal prosecution commencing March 31. The announcement came today as the deadline to respond to a Common Law Court Summons lapsed on Tuesday without any communication from the primary defendants: Pope Francis, Jorge Bergoglio, Jesuit Superior General Adolfo Pachon, and Archbishop of Canterbury Justin Welby. “Their silence is very telling and extremely important legally” said Court Secretary George Dufort from Brussels. This startling development occurred as even more shocking news surfaced today in Rome that the allegedly former Pope Benedict, Joseph Ratzinger, actually retains power at the Vatican, and that since at least 1962 has been a member of a child abuse cult known as the Corona Novem, or The Ninth Circle (or Crown). This recent statement confirms the account of such a ritual involving Ratzinger made by Dutch eyewitness Toss Niejenhuis last year (see http://www.itccs.org, May 8). The Court has also received evidence that the Ninth Circle cult is referred to in Vatican documents which describe how the participation of every new Pope in the Ninth Circle cult is mandatory for their assumption of office. The alleged documents refer to the cultic rituals as “The Magisterial Privilege” that involves the ceremonial killing of newborn children and the consumption of their blood at Circle rituals. The alleged document is translated from Latin and is dated December 25, 1967. This new evidence has been entered into the case records of the Citizen Prosecutors Office of the Court. I need to get a hold of the people in this organization. I’m wondering if they know about the power that Rajinder Singh Duggal wields. Rajinder is the President of the World Fellowship of Religions. In fact, he “initiates” many Catholic bishops, priests, and possibly even popes. The Roman Catholic Church sends dozens of representatives to the annual events (or possibly more than that, I didn’t pay that much attention to the frequency of the meetings), and while traveling, Rajinder initiates nuns too, not just bishops and priests. I was in South America when he initiated a Catholic Bishop who upon receiving initiation, asked Rajinder what he should do now, Rajinder told him to stay in his own religion, so the bishop took off his ring and gave the ring to Rajinder, who ‘blessed’ the ring and personally put it back on the finger of the bishop. 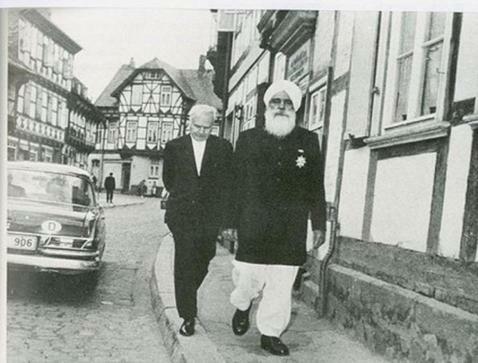 The accounts of this Sikh family 3rd generation bloodline gurus are staggering when one looks at it from the point of view of their involvement on the highest level with the Riman Catholic Church. They are also involved with the Greek Orthdox Church, and the Russian Orthodox Church, to the same high level of initiatiating members such as bishops, etc. Then there is Buddhism, Hinduism, Jainism, Sikhism, etc., Rajinder hangs out with and initiate highest level representatives of all the major religions, and also all the New Age movements.